Marie, Miao and Peter joined Neil and Leslie in Bali and continued on to the island of Lombok, Indonesia, where we met with members of the Jage Kastare Foundation. We spent the next 2 days at the village of Ungge interviewing mothers, trying out the education program in Bahasa on tablets, measuring students, and enjoying the ducks. 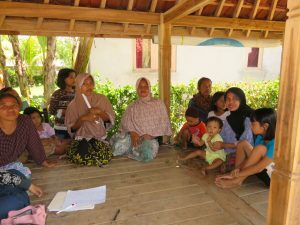 The mother’s group shared with us their hopes and plans and some of their wonderful wares like hand-woven tapestries. The students put on a drama they had written in English. Another high point was a meeting with the SUMMIT Institute of Development and Dr Anuraj Shankar that gave us a chance to hear about their trial of micronutrient supplements in pregnancy. Dr.Shankar’s advice was to “think big.” We look forward to exploring a possible partnership with them.